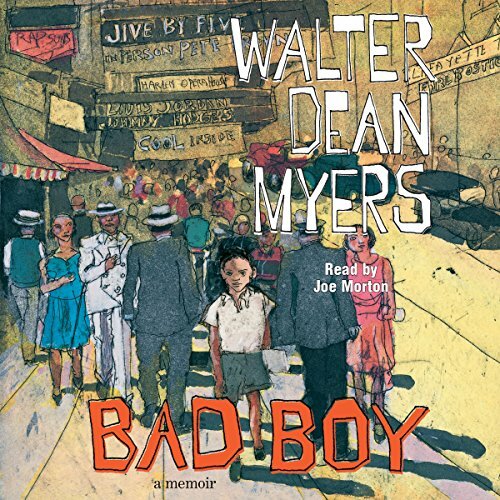 Into a memoir that is gripping, funny, heartbreaking, and unforgettable, Walter Dean Myers richly weaves the details of his Harlem childhood in the 1940s and 1950s: a loving home life with his adopted parents, Bible school, street games, and the vitality of his neighborhood. Although Walter spent much of his time either getting into trouble or on the basketball court, secretly he was a voracious reader and an aspiring writer. But as his prospects for a successful future diminished, the values he had been taught at home, in school, and in his community seemed worthless, and he turned to the streets and his books for comfort. Here in his own words is the story of one of the strongest voices in children's and young adult literature today. What did you love best about Bad Boy? The part I loved the most was that Myers never made excuses for the choices that he made. Rather he shares his regrets. Would you recommend Bad Boy to your friends? Why or why not? Yes I would recommend the book. It is an autobiography of famed writer who lived through the Civil Rights movement. He shares his struggles, but doesn't make excuses. What about Joe Morton’s performance did you like? He had nice phrasing, pace, & expression. No. It was difficult to follow at first. I didn't like the random music that played at random points in the reading. It may have been better if it was played at the end of chapters instead. Different than i originally thought it was going to be deep, reminded me of people I knew. This is nothing like the really book. The story is wonderful, but the recording keeps skipping. This makes it hard to follow the story. LOVE THIS BOOK, it's unfortunate that chapters 1 and 2 are missing from the audio. LAME!